The show had some missteps, but overall it was a marked improvement from last year in one major way: Women dominated the night. 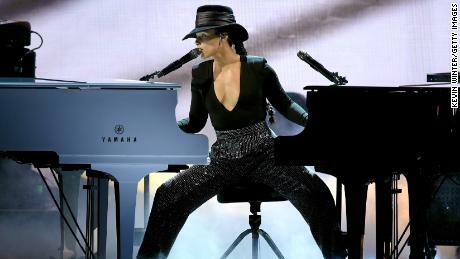 The hashtag #GrammysSoMale went viral after the awards show last year. Recording Academy president Neil Portnow chimed in with a tone-deaf response, saying women “needed to step up” — the music industry equivalent of Sheryl Sandberg’s corporate feminism mantra “lean in,” a comment that totally disregarded the presence of any sexism or bias on the part of the Grammys or the music industry writ large. Camila Cabello opened the show with a Havana-inspired performance of her hit by the same name that featured Latin music stars Ricky Martin, Arturo Sandoval, and J Balvin. Following up on Cabello’s pro-immigration speech from last year’s Grammys, this performance saw Balvin sitting on a bench reading a newspaper whose anti-Trump headline read “Build Bridges, Not Walls.” It’s not insignificant that this was the first time a Latina artist opened the Grammys show. These performances were a pleasant surprise, since I didn’t have high hopes for the Grammys going into Sunday night’s show. It was dogged by controversy in advance, particularly since the artist with the #1 song in the country, Ariana Grande, decided not to perform because she felt the show’s producer, Ken Ehrlich, was stifling her creative autonomy. In addition, multiple rap nominees declined the Grammys’ invitation to perform. Drake, who initially said no, did attend, and accepted his Best Rap Song award for “God’s Plan” with a surprising speech that took a swipe at the Grammys; he declared that as long as fans are buying records and concert tickets, these awards don’t matter all that much. Childish Gambino didn’t attend, although he was the night’s biggest winner, taking home Song of the Year, Record of the Year, and Best Music Video, and Best Rap/Sung Collaboration for “This Is America,” a song that I doubt would have even been considered for these awards if not for its audacious, endlessly analyzable video. His absence suggests that the Grammys still have a hip-hop problem. The fact that “This Is America” was the first rap song to win “Song of the Year” is downright embarrassing, given the fact that hip-hop is now in its mid-40s. Then there was the announcement last week that Jennifer Lopez would be headlining the Grammys’ tribute to Motown’s 60th anniversary, which raised a lot of eyebrows (including my own). Not only is JLo not an R&B singer — she’s widely known to be a much better overall performer/dancer than vocalist per se; to put it bluntly, she doesn’t have the vocal chops or the musical lineage for a Motown tribute. But there she was, headlining a performance that was backed up by Ne-Yo and a Motown legend himself, Smokey Robinson. Diana Ross was already performing in honor of her 75th birthday, but there are dozens of other Motown recording artists who are alive, well, and still performing who would have been a more meaningful choice than JLo, starting with Stevie Wonder, Gladys Knight, Lionel Richie, Boyz II Men, DeBarge, and/or Michael McDonald (who recorded two Motown tribute albums!). JLo should have never been invited to perform this tribute, but given that she was, she should have turned it down. Considering that in 2018 only one woman won a prominent award during the telecast, this year’s winners were much more equitable in terms of gender. Indeed, this year women won Album of the Year (and also represented half the total number of nominees); Best New Artist (most nominees were women); Best Rap Album; Best R&B Album, Performance, and Song; and most of the Country and Pop categories.